"Curve e Biondi Riccioli Viennesi"
This book contains many interesting illustrations of bentwood furniture, advertisements, labels and other markings, etc. from the two collections Thillmann and Renzi. Objects that were previously known only from illustrations, for the first time you can see "in real". 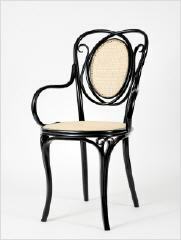 In addition, every collector and lover of bentwood furniture will find the reprint of not yet published sales catalogs of the three largest manufactures of bentwood furniture.